Dedicated players, coaches and trainers know the value of cones. Built with extremely durable, pop-back plastic and a square base design, these cones are engineered to last. Simply add Pro Training Agility Poles to these cones to create durable hurdles for added agility and footwork training. Pro Training Agility Cones aren’t just designed to hold the poles, their square shape and notched stems give you various height adjustments for your drills. . These aren’t your typical cones. They’re more durable, offer more performance and they’re the most convenient when it comes to picking them up and storing them. 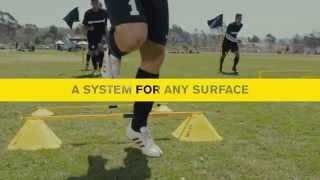 Simply use the Pro Training Agility Cone Collector and pick up a sessions worth of cones in just minutes.